This little book page tree is one of the crafts in the 13 Days project that can easily be transformed into a Christmas craft. Just switch up the color of the butterflies with something more Christmas-y, and you have a little Christmas tree that can be used as a decoration, a favor, a place setting embellishment, or even a (full size) Christmas tree ornament. This craft has a long-ish list of supplies, but many of them are easy to find things like sewing pins, scissors, glue, and toothpicks, so don’t let the length of the list scare you! Make the base of the tree using the same technique as the one used to make the base for the mini pom pom topiary tree. Set aside to allow the glue to dry while you make the rest of the tree. 1. Print the template onto printer paper, and cut out along the dotted lines. Trace the template onto a book page and cut out, using a pair of pinking shears (optional) to cut along the curved bottom of the page. Wrap the page around a small styrofoam tree form to form a cone (I’ve built a bit of wiggle room into the template, so there will be some overlap). 2. Using small sewing pins, secure the cone to the styrofoam form. Angle the topmost pin downward so it won’t go through the opposite side of the tree. Set the tree aside. 3. 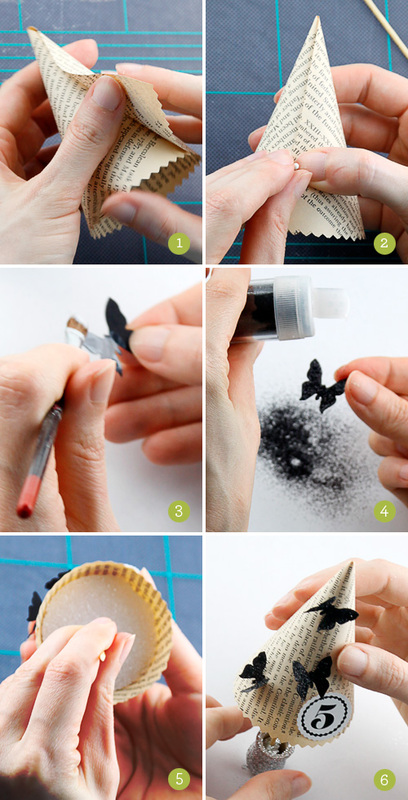 Punch three butterfly shapes out of black cardstock using a butterfly shaped paper punch. Dab a small amount of school glue onto a piece of paper or a paper plate and, using a small paintbrush, cover the front of a butterfly shape in glue. 4. Sprinkle glitter over the wet glue and tap off any excess. Set aside, and repeat the process for the rest of the butterflies. 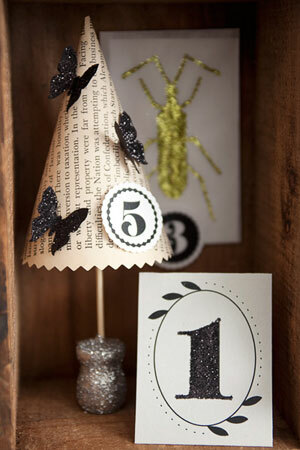 Allow the glue to dry, and attach the butterflies onto the tree using glue dots. Attach the number to the tree in the same way. 5. Insert a toothpick (or skewer that’s been cut to size) into the bottom center of the styrofoam tree form. 6. Insert the other end of the toothpick into the tree base, centering as well as possible, and fill the base with hot glue. Immediately sprinkle with glitter, and hold the tree in place until the glue cools and the toothpick is firmly in place. This may take several minutes. After the glue has cooled, tap off any excess glitter. very nice! Love the little trees. oh i love this! It’s absolutely gorgeous!!! Thanks for all the templates and instructions, they are really appreciated.